Sonisphere 2014 was the first time Classic Album Sundays has hosted sessions at a huge metal and rock festival and we want more! 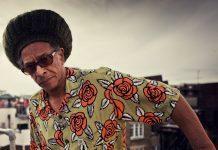 This is a community that is passionate about music and this quality shone through in our intimate sessions, many of which had artist involvement. Many thanks to our partners Jägermeister, Sonisphere, Audio Note, Team Rock and Metal Hammer, Baron David Cobbold of Knebworth House, Frank Turner, Charlie Benante of Anthrax, Gallows’ Wade, Mastodon and their respective crews for making this happen. And of course, thanks to our attendees who heard their favourite albums in a way they never have before. Our own Kieran gives the low-down on Day One and Day Two coming soon as he is still digesting. Photos by Jack Hamps and Jo Kemp. The British festival scene is a beautiful thing. Millions of music fans from across the globe flock to our shores to witness some of the world’s finest music, drink a hefty amount of Jägermeister and experience the kind of indescribable bliss that is being around thousands of people who are as passionate about your favourite band as you are. Sonisphere Festival, nestled cosily within the grounds of the grand Knebworth House, is the glistening jewel in the rock and metal calendar. From July 4th to the 6th, Sonisphere played host to a diverse lineup of epic proportions. From metal giants Metallica and Iron Maiden, to underground heroes Trash Talk and The Bronx, the festival catered for everyone who appreciates their music loud, fast and steeped in grandeur. Sonisphere is not only about the bands; the festival caters not only to the hardened festival veteran, but to anyone at all who is looking for a good time with good people. At Sonisphere, you aren’t going to get judged for who you are and that gives the event a very special community feel. So, obviously it made perfect sense that we at Classic Album Sundays had to be there, to bring our very special community to one of the world’s biggest rock festivals. After two days of the team meticulously installing the £650K Audio Note hi-fi into our space in the Rock Royalty barns, and adding some of the small touches that transforms a room into a haven of musical meditation, we were rearing to go. On Saturday morning at 10:15, I was given the honour of presenting my first ever Classic Album Sundays session on The Prodigy’s ‘The Fat Of The Land’ to an intimate crowd of fans. The album sounded glorious over our beautiful sound-system and before we even had a chance to sit down, the room was filling for the next session. Iron Miden’s ‘Killers’ presented by the wonderful Frank Turner was always going to be a big draw but WOW. The room was packed to the rafters by the time Frank took to the stage. Our own Colleen Murphy interviewed Frank about his life as a Maiden fan, and what the band meant to him and not only was Mr Turner informative and fascinating, but he had the room in stitches on more than one occasion. After a quick fan Q&A, everyone settled in for the entirety of ‘Killers’, one of Frank’s Top Five Metal Albums. Once again the crowd cleared out and before we had a chance to sit down more were surging in. The next session was particularly special. Not only did we have the legendary Malcolm Dome of Metal Hammer (and just about any other rock publication you can think of) joined by Kylie Olsson from Team Rock Radio, but the one and only Charlie Benante of Anthrax graced us with his presence to talk about the band’s iconic album ‘Among the Living’. The session was extremely well received by the band’s adoring fans, who after the talk were primed to hear the cult thrash record in it’s entirety. 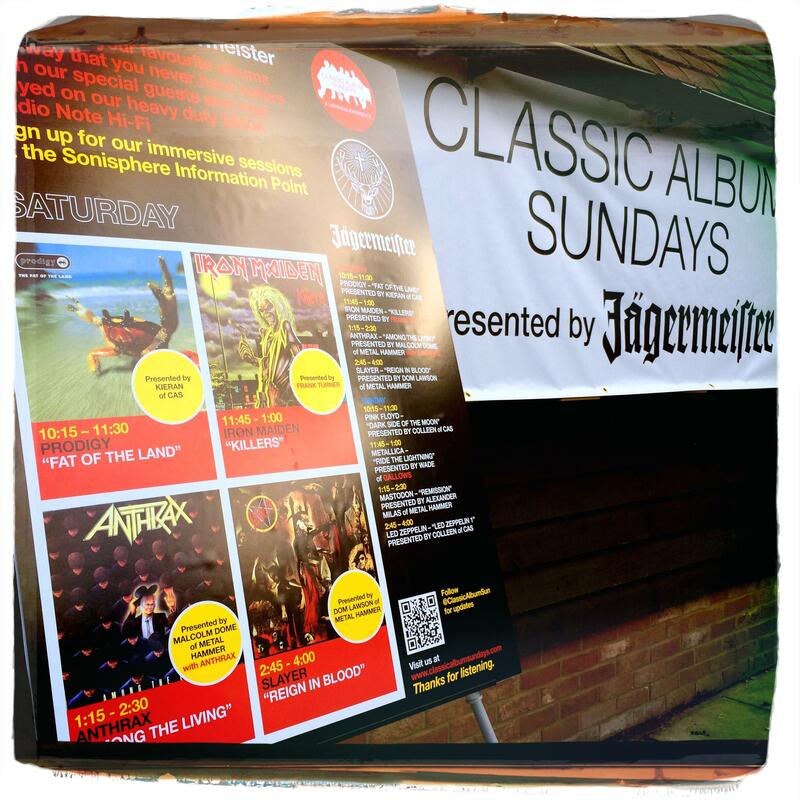 We ended day one of Jagermeister presents: Classic Album Sundays at Sonisphere Festival the only way we could. With the immensely funny, witty and infinitely fascinating guru of rock and metal, the one and only Dom Lawson of Metal Hammer, presenting the musical onslaught of pure adrenaline that is Slayer’s ‘Reign In Blood’. Lawson brought the house down with his declaration of love for both Slayer and ‘Reign In Blood’, and declared it the ‘Ultimate record, from start to finish.” For those who are familiar with Mr Lawson, you’ll recognise what a bold statement that is. As the room settled in to hear the album in it’s entirety, we all reflected on what an amazing, unique and wholly surreal day it had been. Classic Album Sundays at Sonisphere, day one, over. Part Two of our Sonisphere Highlights.